It seems to be a pattern with me and Jump series - I try them out, don't get on with them at first, then return to them after a while and end up loving them. Or at least enjoying them quite a bit. It happened with One Piece, Bleach and in a way with good ole Dragonball. So this is the new hit shounen action series. It's doing pretty well, with quite a lot of promotion, a third season and movie recently announced and a video game in the works too. I tried out the first few manga chapters months ago, but couldn't get over the weird art, especially of the true form of the #1 hero, and found the pacing very weird. That may have been down to poor-quality translation, though. But I eventually tried the anime, and found it to be a lot of fun. The show's world has a lot of echoes of Hunter x Hunter and One Punch Man (OPM itself being in many ways a tribute to HxH in any case), with a little Tiger and Bunny thrown into the mix, all of which could be said to be riffs based on a premise set up by X-Men. Boku no Hero Academia shows us a world where 80% of kids born have a 'quirk'. A mutant power, basically. This can be just about anything, from super strength to invisibility, with some very weird and inventive ones in the mix too. 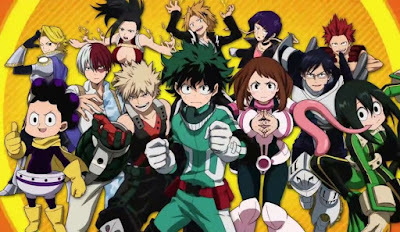 Our hero, little Midoriya Izuku, or 'Deku' as he gets called by the school bullies, is one of the 20% who are quirkless. This is a shame because he loves heroes and could be called a fanboy in the depth of his knowledge. The show actually uses the English word ‘Nerd’ for him, rather than ‘otaku’. A chance encounter with a prominent hero leads to him being bestowed great powers - so he enters a school for the gifted and through a series of exams similar to those in Naruto (even being interrupted by a more serious clash just like Naruto's) proves himself to his heroes and his former bully. There are a slew of anime just like this. A school for the gifted where the sweet-natured, unassuming one ends up the centre of attention and gains great power to use against real bad guys can be seen in, for example, Gakuen Alice, Soul Eater and Mahou Shoujotai Arusu. The basic idea is common in the west too, not only in X-Men but Monsters' High, Miss Peregrine's, The Incredibles et al. It's all basically riffing on superhero tropes and there will be thousands more iterations of the same thing in years to come. But while HeroAka treads familiar ground, it does it well. Midoriya is an extremely likeable protagonist, not only sweet and insecure (and adorable even if everyone keeps describing him as 'plain') but generous, hard-working and ambitious. It's interesting that at first he's given a power he can't really control and causes him great pain, because that opens up dynamics about self-preservation and sacrifice, though by the end of season 2 Midoriya has moved beyond that. The supporting cast is also great. The teachers remind me of Soul Eater's, unhinged and often goofy but awesome to see in action. There are lots of interesting fellow students, from major players with daddy issues or anger issues or abandonment issues to very enteratining ensemble characters like the frog girl or the bird-headed kid with a shadow beast living inside him. Compared with other strong Shounen series, the bad guys are currently a bit lacking. I like the main antagonist’s design a lot but much of his story arc so far has been about finding his true purpose, and a villain who lacks a clear purpose is not a very impressive one. There are other villains here, too, the charismatic and interesting Hero Killer who sadly pales beside One Punch Man’s treatment of a similar misguided philosophy, and All For One who so far is just a shadowy figure pulling the strings with a motive apparently rather like Orochimaru’s in Naruto. There’s a lot of potential for the main villain to become very interesting, but so far it’s only potential. Then again, HunterxHunter, Naruto and Soul Eater were slow in revealing their primary antagonists, and D. Gray-Man waited a very long time to add nuance to theirs so I can see him getting depth later. If mangaka Horikoshi Kouhei fails to deliver on that front, though, it will be a major letdown. Nothing here is groundbreaking, but the best shounen series seldom are. We've had pirate stories and ninja stories and stories about Son Goku before, but the best Jump series make those familiar storytelling realms their own in quirky, inventive ways. The same can be said for Boku no Hero Academia, and it's hard not to root for lil' Midoriya-shounen, whether he's getting all determined, fighting down tears or reaching out to someone in need. As for that weird character design that got me so hung up at the start, well, I guess in the anime it just about works. Just about.